We are proud to say that we brought Fresh Green Garlic to the UK supermarket shelves. This is a fantastic product and gives a whole new range of uses to the humble garlic bulb. Picked from the field before the bulbs have fully matured, the stems should be bright green with a white or purple tinged bulb, depending on variety. 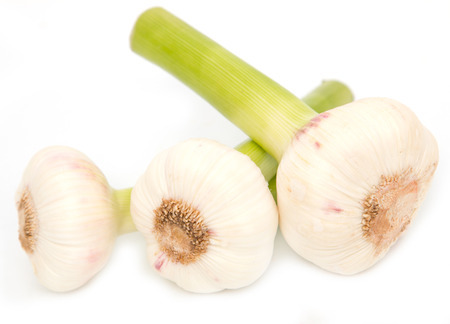 The stem can be sliced and added raw to salads to give a zingy garlic kick. The bulb is best wrapped in tin foil and roasted in the oven with a dash of olive oil. Once roasted, spread it on some crusty bread for the ultimate bruscetta! This year we are working with a new grower from the UK who's keen to make British Grown garlic a success.